Ross Barkley impressed for England against Spain last night. 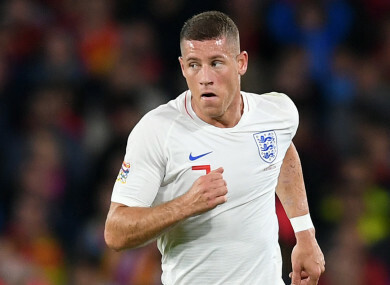 ROSS BARKLEY IS capable of blossoming into a star for England by becoming the type of player they sorely missed at the World Cup, according to Chelsea team-mate Marcos Alonso. After an injury-hit season in which he made just two Premier League appearances, 24-year-old Barkley was left out of Gareth Southgate’s squad as England went on to reach the semi-finals of the tournament in Russia. The central midfielder’s revitalisation at Chelsea under Maurizio Sarri this season, however, has coincided with his return to international football as he started both of the Three Lions’ UEFA Nations League games against Croatia and Spain. The former Everton man played an important role in midfield as his side won 3-2 away against La Roja on Monday, and Alonso believes he can become a decisive figure for club and country. “Even at the World Cup England, despite playing well, were aware that they didn’t really have that kind of player, someone in the middle who played and made others play, who used the ball,” Alonso said. “He’s a great player. He showed it not just [on Monday] but against Croatia too: he showed that he can be a great player. I hope he keeps improving and that he helps us at Chelsea to stay near the top. An excellent start from England saw them take a three-goal lead within the first 40 minutes in Seville, but Luis Enrique’s team fought back through a Paco Alcacer header early in the second half before Sergio Ramos scored just before the final whistle. But Spain complained that they were denied a penalty when England goalkeeper Jordan Pickford lost the ball to Rodrigo and there were claims he pulled the attacker back as he recovered to knock the ball out of play. Alonso believes his team were right to feel hard done by, as he feels it was a crucial moment in the game. Email “Chelsea star can fill role England missed at World Cup - Alonso”. Feedback on “Chelsea star can fill role England missed at World Cup - Alonso”.